Central Warehousing Corporation New Delhi has advertised in THE HINDU newspaper for the recruitment of Manager / Engineers (46 Posts) jobs vacancies. Interested and eligible job aspirants are requested to apply on or before 01st November 2018. Check out further more details below. or a Member of the Institute of Chartered Accountants or of the Institute of Cost & Works Accountants. Superintending Engineer – A degree in Civil Engineering from a recognised University. Preference shall be given to candidates with Post-Graduate qualification. mode of payment shall be accepted. The demand draft/ banker’s cheque/ pay order should be in favour of the Central Warehousing Corporation and payable at Delhi. (i) Affix their coloured photographs at the space provided in the application and append signatures at the requisite places. (iii) Have a valid personal email ID, which should be kept active till the completion of this round of Recruitment Process. 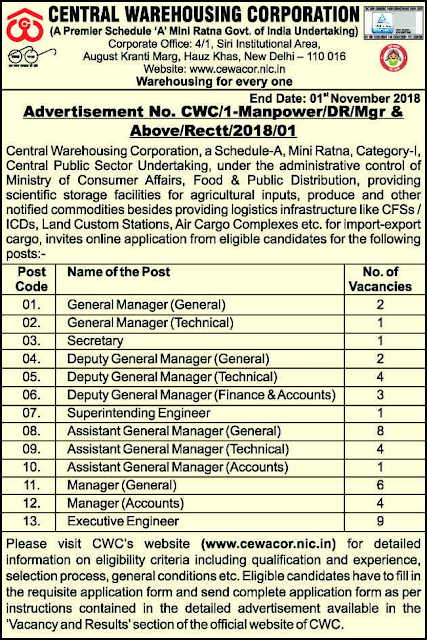 CWC shall send call letters for the Interview/ Document verification etc. through the registered email ID. Under no circumstances, a candidate should share with/ mention e- mail ID to/ of any other person. In case a candidate does not have a valid personal e-mail ID, he/she should create his/ her new e-mail ID before applying and must maintain that email account.